Whether you're a professional or just starting out, you'll appreciate the qualities of these amazing tools. Handmade by Da Vinci from pure Russian Red Sable winter tail hair, these extra sharp watercolor brushes are renowned for their ability to point, spring, and hold their shape. Soft yet resilient, they have exceptional water and color carrying capacity, for detail work or delicate blending. They feature short black lacquered handles. 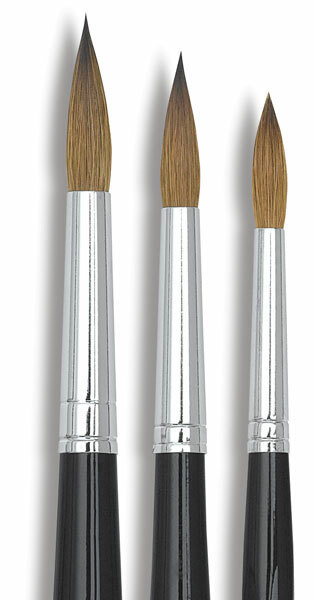 #5359 Kolinsky Round — This five-brush set contains Series 36 Round sizes 0, 1, 2, 4, and 6. #5360 Kolinsky Round — This three-brush set contains Series 36 Round sizes 8, 10, and 12.